At the beginning of 2014 we began a major reassessment of what we want our website to do, and we did this in the context of asking ourselves who is it for. This involved seeing our audience not as a homogenous bunch of “visitors”, differentiated only by demographic variables such as age and nationality. Understanding visitor motivation is a critical issue, and it is clear that for a satisfactory visit either to the Museum or its website we have to support visitors’ motivations and expectations. A searching analysis of our existing audience challenged our thinking on how best we might meet the needs of that audience online. We looked outwards at other websites for inspiration, looking for examples of best practice and examples of what we want to avoid. We looked at these from the perspectives of ease of navigation, how the content was handled, and visual attractiveness. We were highly conscious of the need to make the site easy to navigate and as uncluttered as possible, while at the same time not dumbing down the content. 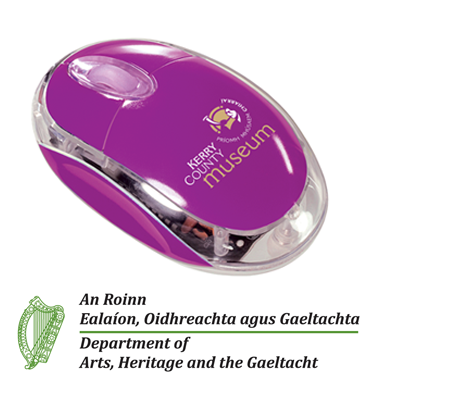 We were very lucky to receive funding from the Department of Arts, Heritage and the Gaeltacht, under the Scheme to Assist Local and Regional Museums. This enabled us to secure the services of Kerrynet, and we think they have done a great job in providing us with a superbly designed website that reflects the dynamic institution that is KCM.